Gold Rush #1 - What a great start! The first Gold Rush is over, and what an event it was! A huge congratulations to the winner of the inaugural Gold Rush, Daniel Murphy! After the hard fought 2 day event, Daniel managed to best his 31 opponents to take top spot! He picked up the lion's share of the $20,000 Prize Pool, $10,000, for his efforts! 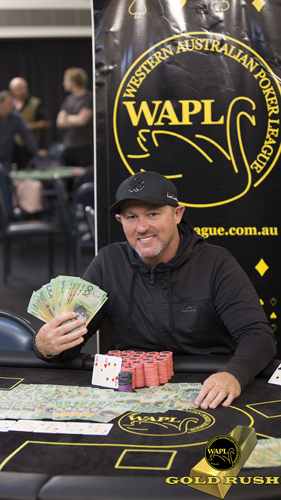 Top 4 were paid, and we saw WAPL regular and long time player Matt King take down 2nd place, for $5,000. 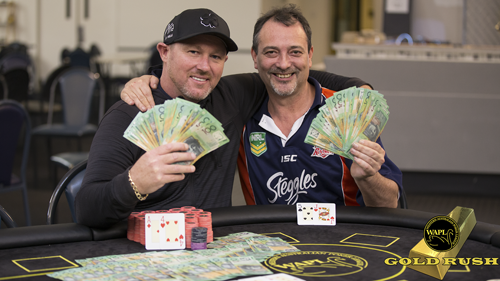 The well known, feared, and respected player Dale Marsland came in 3rd place, winning $3,000. He played a great tournament, and was our most aggressive player on Final Table. We saw Stefen Chitra, who entered Day 2 as our massive chip leader (over 1/4 of the chips in the tournament!) take out 4th place, taking $2,000 for his great effort! We are so glad to hear such great feedback from the event. Needless to say, we will make a few minor tweaks, but will be back with Gold Rush #2 soon! Make sure you qualify for one of the next 32 $700 Main Event seats quickly, or pre-register and buy straight in to secure your spot! You can Qualify at any of our events through our 4 player FLIP RUSH, or via our $100 Gold Rush Satellites (1 in 8 win a Main Event Seat!) Your next $100 Satellite opportunity is This Thursday 3rd May @ Scarborough Sportsmen's Club! Thanks to all who had enough faith in us and our new Main Event structure to jump in and give it a go. We're overjoyed at how things went, and glad that the event met (and largely exceeded) your expectations. Having the final table streamed on our WAPL Live Table allowed many viewers from around the world to experience the fun of our Gold Rush Final Table. Looking forward to the next one, PM us to secure your seat before they all run out! Enjoy the photos from the event, and congratulations again to our winners.